Wow. If you’re reading this, you need to make this dish. Even if you’re not reading this, you still need to make this dish. It is that good. I absolutely loved these flavors together. The tomato sauce and Parmesan cheese made it taste rich but the lemon zest and herbs gave it a bright, fresh flavor as well. The perfect comfort food for Spring! I had never cooked with farro before, but it’s a very healthy grain with a texture reminiscent of barley and it’s a great source of both fiber and protein. This is a great vegetarian main dish, but it could also be a delicious, cheesy side dish. Either way, you won’t be disappointed! Pre-heat the oven to 400 and make sure you have a rack in the top 1/3 of the oven. Lightly coat an 8×8 baking dish with olive oil cooking spray and set aside. Combine olive oil, onion, salt and garlic in a large saucepot and bring to medium-high heat. Stirring occasionally, cook until onions start to turn translucent. Add farro and stir until onions and farro are mixed thoroughly. Cook for 1 minute. Add tomato sauce, broth and basil and stir. Bring to a simmer and then remove from heat. Stir in lemon zest and 1 cup of the Parmesan cheese. Transfer the mixture into the prepared baking dish and cover with aluminum foil. Cut a few slits in the foil. Put the dish in top third of the oven and bake for 45 minutes, removing the foil for the last five to let the top darken. Remove from oven and sprinkle with remaining cheese and oregano. 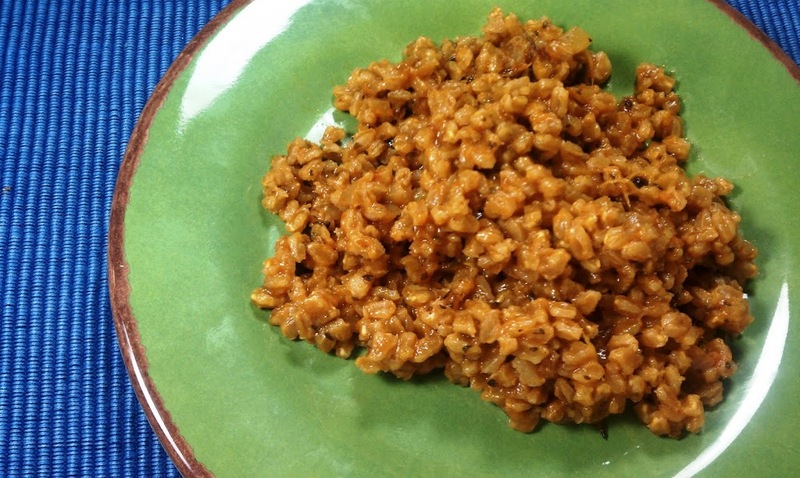 It looks delicious and simple to make, but what exactly is Farro and where would I find it in the store? It’s a grain, so they might have it where they keep the barley or rice. My grocery store (Wegmans) had it in their “Nature’s Marketplace” section which has a lot of the organic stuff and is where you can find grains like Quinoa and Farro. I bought mine packaged but some grocery stores that have bulk grains might have it there as well. If you can’t find it, I’m sure you could substitute barley and it would be just as good! I’ve never had farro before. Wonder if this would work with risotto? Jenna, I’m not sure if you mean substituting arborio rice for the farro or if you just mean cooking it on the stove top like risotto. I’m sure you could probably modify it either way. 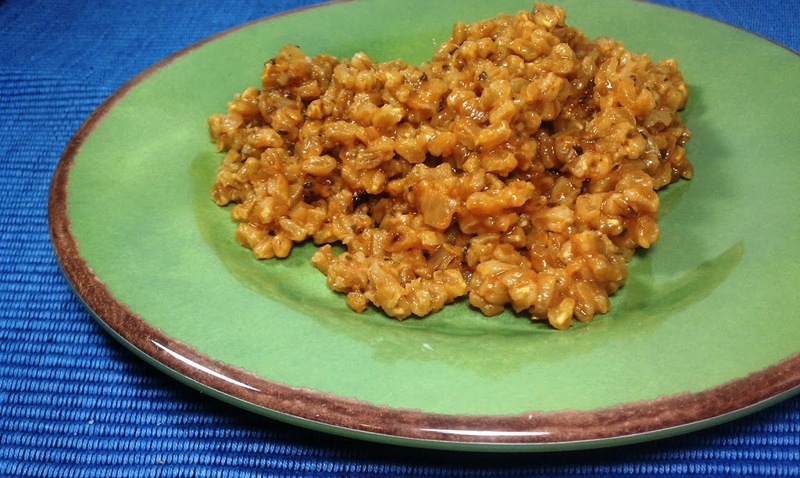 If you substitute arborio rice for the farro you may want to experiment with the cooking time – I’m not sure if that would be affected by the switch. Good luck! Mmmm. It looks hearty and delicious. I’m trying it out tonight, I’ll let you know how it is with barley! I’m pretty sure barley has a higher points value than farro. I think it will still taste great with barley though! Hopefully the cooking time will still be appropriate. Let me know how it turns out! I recalculated the NI using barley and it was the same. Really good! Delicious as leftovers too! Ok, so just made this and it is delicious. 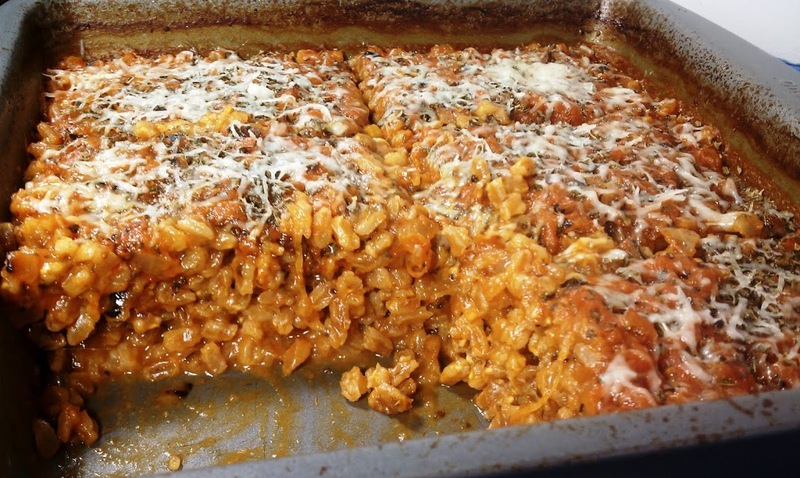 Quick question though; was wondering if it is supposed to be solid (not exactly the word but I can’t think of anything else right now) like a lasagna or more loose, like a risotto? Mine came out more like a risotto, and just wanted to make sure I didn’t do something wrong with it. Thanks! Lindsay – kind of in between? More leaning toward a risotto consistency though. It sounds like yours probably came out perfect. I’m glad you liked it! Isn’t it the best? I need to make this again soon, I really really loved this recipe. So glad it was worth the effort! FINALLY found farro at the Fresh Market after looking at a coupe of health food/ grocery stores in the area. I’m cooking this dish tonight so I’ll have to trek to whole foods in the future if I love it bc the only farro package I saw at FM is being discontinued! I hope you love it! My grocery store carries it but it seems like not very many others do. Let me know if you think it’s worth the trip! I haven’t been able to find farro yet in my area! I have everything else I need to try this recipe out, it sounds delicious! I’ll keep looking…..
Just found your site…just found this recipe.The dish was incredible and I love your site. hey! i was wondering- does the farro need to be cooked (boiled and softened) before being used in the recipe, or do we just toss the dry farro in? thank you! I have the same comment as the poster above – does the farro need to be cooked before being added? I have never used wheatberries before so I can’t say. If you try it out let me know! I’ve never used spelt before, so I can’t comment on that, but previous posters used barley and that worked out great! Love this recipe. I need to know the amount of carbs. Hubby is a diabetic and I’m on weight watchers. Very good, nice and al dente, but too lemon-y for me. I might eliminate the lemon next time…and I was thinking about maybe adding spinach. My BF accidentally bought regular farro, and I sent him back out for pearled farro. Raw, they look the exact same. I haven’t cooked the regular farro yet so I’m interested to see if it’s any different from the pearled farro at all. This was a great hit & will become a regular addition to our menus (and a variation from our farro soups my daughter loves). We made it a bit more vegetarian by adding about 1/2 bag grated carrots, 2 grated zucchini & 1/2 pound baby spinach, then baked in an 8 x 11 dish. Next time we might use kale instead, but the spinach was in the fridge so …. This was amazingly good. I’ve already divided the remaining portions for my lunches for the rest of the week. I’ve put my husband on notice that they are off limits to him, I loved it that much :-). Thanks so much for the awesome recipe!! I was only able to find regular farro (not pearled). Has anyone made it with regular? If so, would youreccomend any changes to the preparartion? Thanks! To answer my own question, I used regular farro and baked it for one hour. It was delicious! I’ve made a lot of your recipes and this one was just as great as the rest lived it!! Hey, I made this tonight! Really tasty and different. I’d never had farro before. I was wondering if you or anyone on here knew if it would freeze ok? Do you use raw or cooked ferro? I just made some ferr for a salad, and have so much left over, and was thinking about your dish…so cooked or raw? This recipe is phenomenal! I made it as is the first time and added some fresh sliced mushrooms while cooking the onions the second time. It’s equally delicious both ways! Add a little grilled shrimp and salad or veggie of choice and this is one filling, satisfying meal! Thank you for posting it!!! The c is for 1 cup…hope that helps! Could I prepare this in the morning, store it in the fridge and wait to bake in until the evening? This looks great. I recently bought a 10 minute farro at Trader Joes and was wondering if I could use this instead of the pearled farro? Thanks for your help in advance. I used the trader joes farro and it worked perfectly. This was a really good dish! I did add green peppers and ground beef with the onions, but otherwise pretty much made as is. Figured my husband would be more receptive if I told him it had meat. He gives me the silent grumble when I mention grains he’s not used to. He actually said it was a five star farro meal! Would definitely make again! I add a 16 oz package of frozen veggies and a 16 oz package of frozen spinach, then bump the tomato sauce to the full can. I’ve made it several times and freeze to take for lunches.